For those of you who won't care, I finally found a favicon to match my blog. Favicons is short for favourites icon in the way blog is short for weblog but only a dork would know that so, quickly, erase this sentence from memory after reading. Erased? What? Nothing. A favicon is the little website icon you see in browser's address bar or before the page title in the tab or, like duh, in the favourites menu or bar. I used to have a scrabble letter P for Phamly because, in case I hadn't told you twice already, which I did - Little Sissy Pham and I are obsessed with Zynga word games. Anyhoo, the scrabble P never did sit right with my blog because scrabble implies intelligence, being well-read, having a great vocab and impeccable spelling. 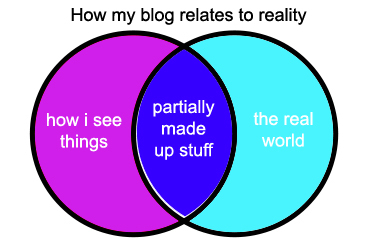 None of which is relevant to this blog whatsoever! So last Sunday, while I was waiting for my 'retro-future' silver nails to dry (quoting editor colleagues who are intelligent, well-read, have great vocabs and impeccable spelling here), I trawled the internet for a favicon that suits my blog. I, of course, found it in the nerd department. The favicon I've picked is 'logic not' - you know, from when your math/science teacher explained/bored you with the AND, OR, NOR, snore partially overlapped circles? These circles are venn diagrams - you may want to erase this dork fact sentence from your memory too. This favicon makes perfect sense for my blog because my blog makes no sense at all. I write about whatever I feel like. I make big bold statements that are completely untrue or partially made up on the spot, but because I use my grown up voice people 'respact mah authoritay' when really I have just made them that little bit dumber for having believed me. Even the 'dynamic' navigation I've picked for this blog is illogical and pretty much designed to discourage people from actually reading any of my posts. Logic not favicon = perfect!